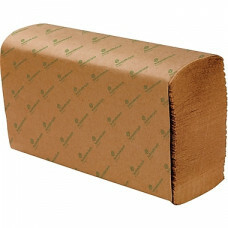 Sustainable Earth by Staples® Multifold paper towel in natural colour measures 9.50" x 9.125" and functions smoothly with dispenser. 1-Ply embossed paper towel is ideal for commercial/public restrooms and sold as 4000 per case. With these Sustainable Earth multifold paper towels by WellnessMed Supply , you can rest assured that your paper towel use isn't damaging the environment. Whether you use them for drying hands or wiping away spills, these towels handle the job with ease. thousand towels, separated into sixteen smaller packs, so you won't run out quickly. Soak up spills and wipe up splashed liquids with these one-ply paper towels. The embossed surface increases the absorbency. to make your entire bathroom environmentally friendly.